Even if you've made peace with the notch, adding another dash of sophistication and elegance to your Google Pixel 3 XL may make you forget about it altogether. Plus, the added protection of a leather case means your phone may last until Google decides to release a notchless XL model again. These are the best leather cases for the Pixel 3 XL. A purveyor of fine leather goods, Bellroy has partnered with Google to create luxurious cases for each generation of Pixels, and the Pixel 3 XL is no exception. Available in five colors and two styles, these cases are every bit as refined as the Google flagships they cover. London-based Snakehive created some super-sweet feeling leather cases in a variety of colors, and its case for the Pixel 3 XL feels soft and volvety in the hand. This case is a delight to hold and for a genuine European nubuck leather case, it's quite well-priced. This wallet case has bright white stitching, which is a great contrast against the black faux-leather. It also features a triangular magnetic closer, and the cover folds back into a steady kickstand. There's space for three cards, as well as a cash pocket inside. This leather case is as slim and unique as it is functional. This case sports slots for two cards, but it's beautiful enough to use empty or full. While it also comes in brown and red, I find the Navy Blue to be the most striking. This lithe leather case wraps not one but two beautiful shades of tanned leather around the back and sides of your Google Pixel 3 XL, while the minimalist design leaves your ports, sensors, and buttons open and easy to access. Choose between two color palettes for a unique case with a premium feel without a premium price tag. 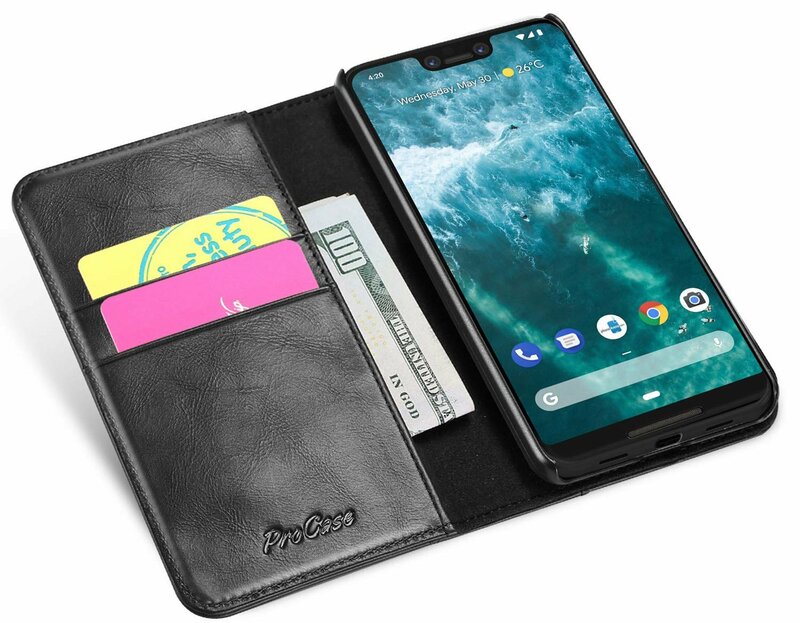 ProCase's genuine leather wallet is an excellent option, with three gorgeous colors to choose from, room for two cards, a cash slot, and a front cover that folds into a kickstand. The cover features a magnetic closure, though without a clasp, making it seamless. 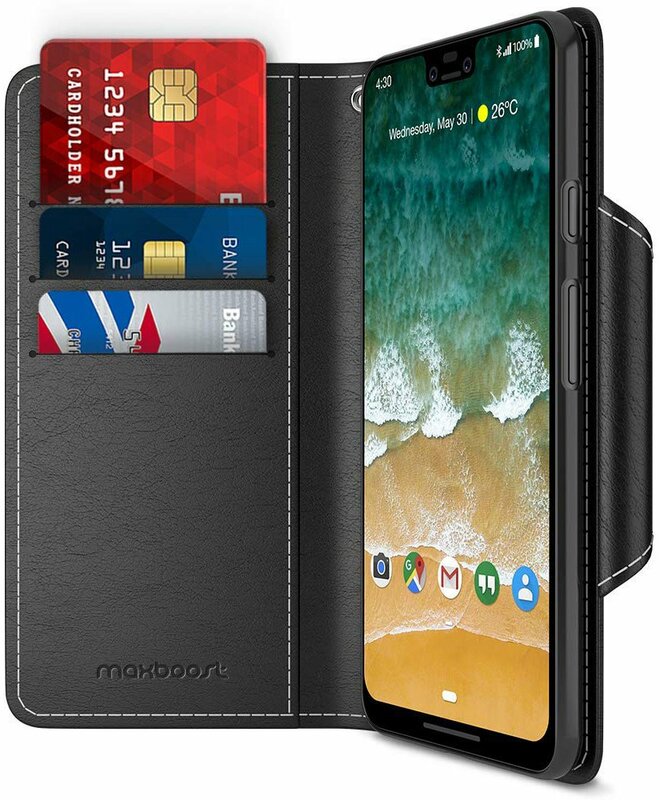 A leather case is a great way to add some much-needed protection to your Pixel 3 XL, and it serves as a note of elegance and sophistication that complements your hardware nicely. For my money, the Bellroy Leather Pixel Case is the best option, because it has superb color options and a gorgeous design, but the ProCase has style all its own for a more affordable price.